Is your child is just starting to learn to read? Have they been struggling for quite some time? FFR Home Edition's research based methodology takes out the road blocks and unlocks your child's overall reading abilities. With Failure Free Reading's online reading program your child can unlock their vocabulary and overall reading skills all from the comfort of their own home or on the go! Failure Free Reading Home Edition is a research based online reading program that diagnoses the user's current reading level, then places them in the appropriate entry point in the program enabling them to instantly accelerate their vocabulary, comprehension, self confidence and overall reading ability. Once the pre-test is done to place the user, they are introduced to essential vocabulary and phrases that they will be learning . (FFR's core vocabulary is built from the most commonly used words in the Academic English Language that are essential for reading success. No uncommon names, dates, places, or phrases allow for the user to completely understand and relate to the material without have to have a prior reading ability). Through a series of researched based scaffolding teaching techniques the user will be able to experience what it feels like to read successfully- instantly motivating them to continue forward with increased confidence. Failure Free Reading's research based methodolgy removes the road blocks found in traditional reading programs allowing for the students process to be streamlined so they can feel what it is to read fluently and successfully from the first lesson on! What does a Failure Free Reading online lesson look like? See some sneak peeks from different sections within the program. Keep in mind users will be placed in a K-12 spectrum so different levels will have different information and vocabulary that is appropriate. 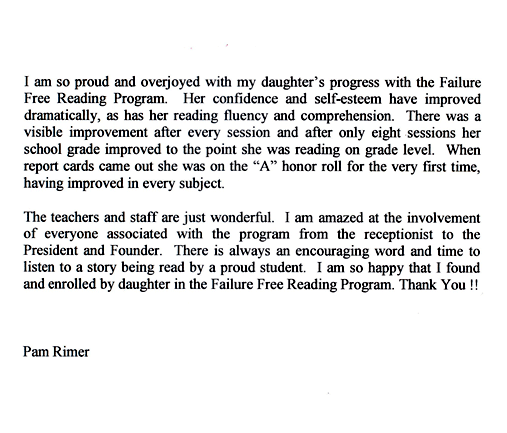 See what teachers have to say about the Failure Free Reading Program! Why have your child just playing a simple game or app when they could be accelerating their vocabulary, self confidence & overall reading ability on the go! Trusted by educators and parents for over 30 years now you can use The Failure Free Reading Program (FFR) to find out what your unique current reading level is today and unlock you or your student's reading skills, vocabulary, comprehension. Anyone wanting to accelerate their current vocabulary and overall reading abilities! Whether your child is just starting to learn to read or has been struggling for quite some time, FFR Home Edition's research based methodology takes out the road blocks and accelerates your child's overall reading abilities. Subscribe to our complete program or just try one lesson either way your child can finally experience reading success.